My girls have always enjoyed Eric Carle's books so in honor of his birthday I wanted to have another Eric Carle celebration like the one I hosted last year. This year I have teamed up with some amazing bloggers to bring you what I hope will be a wonderful resource of Eric Carle related activities/links. 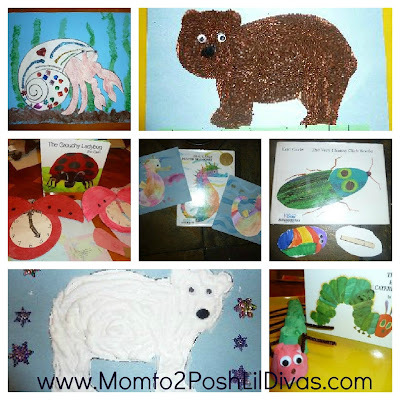 To kick off our official Happy Birthday Eric Carle week I am going to recap some Carle activities we have done with a few of our favorite books. During the week, I will be sharing a few new ones with you. We had a lot of fun reading some Carle books we hadn't read before like Pancakes, Pancakes, Walter the Baker and their newly found favorite - Hello, Red Fox. The Lil Divas decorated a hermit crab's shell after reading A House for Hermit Crab, made a coffee grounds Brown Bear, Brown Bear, a clicking, flipping Clumsy Click Beetle, painted a Watercolor Seahorse Carle Inspired Scene, learned to tell time to the hour with Paper Plate Grouchy Ladybug Clocks, made a classic Egg Carton Very Hungry Caterpillars and had fun with Puffy Paint Polar Bears. Thanks for this great link up! We love Eric Carle. Your coffee ground brown bears are just adorable! What a great idea! thanks Kim! My girls have loved his books growing up and we have had lots of fun with them.